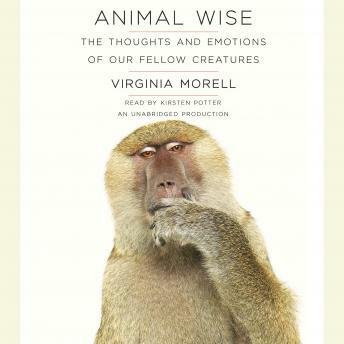 Noted science writer Virginia Morell explores the frontiers of research on animal cognition and emotion, offering a surprising and moving exploration into the hearts and minds of wild and domesticated animals. Have you ever wondered what it is like to be a fish? Or a parrot, dolphin, or elephant? Do they experience thoughts that are similar to ours, or have feelings of grief and love? These are tough questions, but scientists are answering them. They know that ants teach, earthworms make decisions, and that rats love to be tickled. They’ve discovered that dogs have thousand-word vocabularies, that parrots and dolphins have names, and that birds practice their songs in their sleep. But how do scientists know these things? Animal Wise takes us on a dazzling odyssey into the inner world of animals from ants to wolves, and among the pioneering researchers who are leading the way into once-forbidden territory: the animal mind. With thirty years of experience covering the sciences, Morell uses her formidable gifts as a story-teller to transport us to field sites and laboratories around the world, introducing us to animal-cognition scientists and their surprisingly intelligent and sensitive subjects. She explores how this rapidly evolving, controversial field has only recently overturned old notions about why animals behave as they do. She probes the moral and ethical dilemmas of recognizing that even “lesser animals” have cognitive abilities such as memory, feelings, personality, and self-awareness–traits that many in the twentieth century felt were unique to human beings. By standing behaviorism on its head, Morell brings the world of nature brilliantly alive in a nuanced, deeply felt appreciation of the human-animal bond, and she shares her admiration for the men and women who have simultaneously chipped away at what we think makes us distinctive while offering a glimpse of where our own abilities come from.